At Eugene Family Dental, Dr. Kirchmeier, your family dentist in Eugene, and our friendly staff want all our patients to enjoy a lifetime of quality oral health. If you want to avoid paying any out of pocket for expensive dental procedures that insurance will cover a fraction of, here are a few ways to avoid dental decay that causes cavities, tooth loss, and gum disease. One of these ways may even surprise you. A no-brainer when it comes to protecting the health of your teeth and gums, the American Dental Association recommends brushing twice a day for at least two minutes and flossing once before bedtime. Practicing quality oral hygiene helps to remove harmful bacteria and food particles that linger in the mouth after eating that contribute to tooth decay and the development of gum disease, which can result in tooth loss and the need to undergo expensive dental procedures such as tooth extractions, implants, dentures and bridges. When you do brush, make sure to take the time to adequately clean each quadrant of your mouth. The ADA recommends dividing your mouth into four areas, and spending at least 30 seconds brushing each one. Also, don’t forget to change your brush at least once every three months, as old toothbrushes with broken or frayed bristles fail to adequately clean the mouth. Overindulging in sugary treats, especially soft drinks, ranks as one of the worst habits you can subject your teeth to. Harmful bacteria that grow in the mouth thrive off of sugar. When you consume too much, or drink high numbers of sweetened beverages like soda, oral bacteria transforms sugar into acid that eats away at tooth enamel, which directly contributes to the development of tooth decay, cavities, and gum disease. In addition to cutting down on sugar, you also need to increase the number of crunchy fruits and vegetables you eat on a daily basis. While also helping to improve your chances of losing weight, eating multiple services of cucumbers, apples, carrots, and other crunchy produce can help improve your oral health. Referred to as “nature’s toothbrush” , these types of fruits and vegetables work to scrub your teeth clean of bacteria and other food particles when eaten. Because these foods also have higher water content, they help to rinse the mouth when eaten, as well. Many oral health problems can begin to negatively impact your teeth and gums long before they manifest any noticeable symptoms. Once gingivitis or periodontitis develops, it can become nearly impossible for your family dentist to successfully prevent any lasting damage to your teeth or gums. In recent years, a number of studies have tied gum disease to a number of chronic illnesses, including heart disease, stroke, diabetes, and obesity. Individuals who smoke have between a two and three times greater risk of developing gum disease when compared to nonsmokers, according to the Centers of Disease Control and Prevention. Continuing to smoke while undergoing treatment for gum disease has also been shown to reduce the effectiveness of treatment. Oral health experts say that roughly 50 percent of bacteria in the mouth live on our tongues. Despite the tongue housing so the majority of oral bacteria, most people completely overlook cleaning the tongue as part of their nightly oral hygiene regimen. Using a tongue scraper can help to remove excess bacteria from the mouth and improve your overall oral health, while only requiring you to spend as little as one additional minute taking care of your oral hygiene. 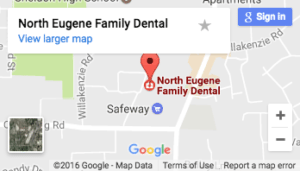 If you have any other questions about the best practices for improving your oral health in 2016, feel free to ask your family dentist in Eugene, Dr. Kirchmeier, during your next appointment at North Eugene Family Dental. Indeed, sugar is really bad for your oral hygiene. I didn’t know that it wasn’t the sugar itself that is the problem though. I would love to look into these bacteria that feed on sugar, see what else feeds them really well.